There is not much information available about this Italian prog rock band. They have been around since 2005, but their MySpace page is noticeably lacking in details. If you Google “Flower Flesh” you get all kinds of information about carrion and corpse flowers, and there is also an Indonesian band of the same name. The title of this release, Duck in a Box, is even more obscure. For the life of me I cannot determine what it means as the seven songs and titles give no hints. 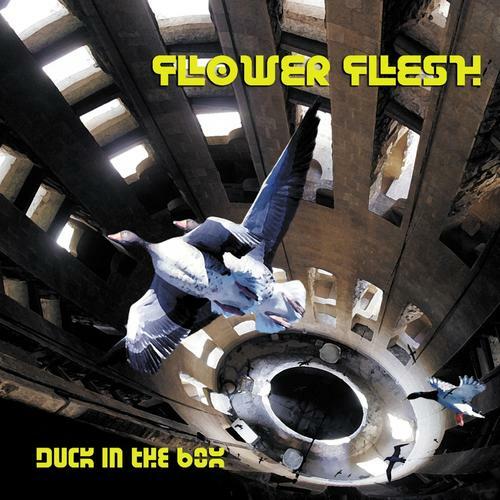 Nevertheless, Flower Flesh is part of the current resurgence of 70s-style prog rock in Italy. The band is the quintet of Ivan Giribone (bass guitar), Andrea Fazio (drums), Marco Olivieri (guitar), Eros "Elvstrom" Indimberge (lead vocals), and Alberto Sgarlato (keyboards and synths). Most of the seven symphonic prog songs are in the five to six minute range. However there is a certain sameness to the songs; there are moments of brilliance, but these tend to get mired in the mix. It is as if the band could have used a bit of guidance to better hone their music. For example, “Antarctica” could have been an excellent mood piece as it begins with a lot of promise using shortwave clips and cold winds, but it immediately shifts into a standard 70s prog song with nothing to make it stand out from the rest. Highpoints for me on the disc are “My Gladness after the Sadness” with its Al Stewart-like guitar line and synths that builds to a majestic end, and the closing track “Scream and Die” that is simply superb and a great way to end the disc. The analog synths and Mellotron are great, but the disc is uneven. Hopefully over time the band will find their voice and their next release will be better focused.